1st book event in Iceland! It is 3 a.m. and despite utter exhaustion my brain refuses sleep. I can attest to the fact that it has not gotten dark, not for an instant. The birds are singing all night long and I fear they must be as overwrought as I am. Tomorrow, i.e., today, is a big day, the first official day of the book tour. Radio interview in the morning, book event in the afternoon, dinner party for whichmy cousin and host Hrefna has prepared a ham marinated in blueberries and some kind of red Icelandic berries from her garden. Then a TV interview the following morning, another book event in the afternoon, dinner out with friends I have yet to meet in person. And then the next morning we head for the volcano, which seems to be slumbering still, and the glacial lagoon. But tomorrow, meaning today, feels like the biggest day, somehow. At the book even this afternoon I will read out loud from my novel in Icelandic. My greatest fear is that I will somehow make the beautiful Icelandic language discordant to my listeners, but really I'll be thrilled if they simply understand me. Hrefna helped me make my f's sound more like v's and my t's sound more like d's and we removed one word from the piece that is just too horrifyingly difficult to prounounce. Then I finished my Powerpoint presentation and Hrefna proofread the slide titles, which are all in Icelandic in case some people in the audience aren't completely following my English. These would be mainly older people, who are sometimes not as astoundingly fluent in English as so many Icelanders are. Earlier in the day I had a 2 hour interview with Eyglo from The Iceland Review at a cafe in Reykjavik, which was just lovely and stimulating. She helped me to understand a dream I had in 1985 about the Icelandic grandmother I never met pushing words out through my fingers in a stream of light. This while Oliver was playing golf at the lava-ringed course in Hafnafjordur. And this evening a dearly romantic dinner with Oliver by the lake, unbelievable fish soup, divine shrimp, mussels, lobster tails, smoked beef tongue, lamb medallions, finished with flan and, for Oliver only, the dreaded Harkarl (fermented shark meat), which he seemed to thoroughly enjoy chased down with Brennavin. Then a very deep and intensive half hour conversation with our Turkish waiter, who speaks English with an Icelandic accent and is about to become an Icelandic citizen. "Iceland is not for everyone," he said. But, we agreed, it is certainly for some of us. And then I fell into bed in the deepest exhaustion, sure that finally I would sleep after nights of sleeplessness but no, here I am, after three hours of uselessly lying in bed I have gotten up and eaten a banana and written this blog. I wish could post photos of the lobster and hakarl and especially the lake and birds but we haven't even begun to sort through all the photos from yesterday. Plus we forgot the camera and maybe that was for the best. The strange thing is that I have a black eye mask and a black curtain to block out the light and earplugs to block out the birds and even sleeping pills. But my brain is somehow stodgy and insistent: if it isn't dark, then it isn't night. And by now it really is day, if it ever wasn't. May sleep be with me. As soon as we reached Thingvellir and began walking along the narrow chasm of Almannagjá, emotion-charged memories surged through me: not memories of my own visits to Thingvellir, but the memories of the characters in my book. Happy memories, of Freya and Saemundur walking along the top of the chasm, flirting by the Drowning Pool where witches were summarily dispatched in centuries past. Ulfur explicating Icelandic history at the Law Rock, where the first Viking settlers held their outdoor parliament in the 10th century. And feelings of turmoil, as I saw the spot where Birdie turns against her friend Ulfur, insisting he drop her and Freya off at Thingvellir to wait for a bus back to Reykjavik. And the bus comes and Freya tries to get on and Birdie stops her. And the desolation Freya feels as the bus drives off, stranded with Birdie, and their wretched hours-long trek around the lake. A turning point in the book, the point where Freya realizes that she is now hopelessly entangled in Birdie’s madness. I remember too my actual memories of visiting Thingvellir several times over the years, yet memories of my actual visits were not as strong as my fictional memories, memories of the fictional scenes I created for my book. These were scenes are in some ways more real to me than life, I inhabited them for such long periods of time in my mind, writing and rewriting, feeling and refeeling, seeing and reseeing each place, each exchange of conversation, the feel of the wind blowing ceaselessly against Freya’s face. Today at Thingvellir: seven giant swans, rising up, puffing out their chests, beating their massive wings in the air, then taking off in a white ruffle across the still green water. After being awake for 24 hours in a row, we landed in Reykjavik at 6:30 a.m. this morning on a flight where the sun never set. It just kept glaring brightly through our window for the whole 8 hours. It was the strangest landing I’ve ever had into Keflavik. There was no rain, sideways or otherwise. There was no fog. There was no May snowstorm. There was just… bright sun and blue sky! We found our rental car by wandering through parking lots of Hertz and Avis and Budget, each separated from the others by walls of lava rocks. Oliver navigated us straight to my cousin Hrefna’s house (not a single wrong turn), where we had a wonderful breakfast of breads with cheese and homemade, local berry jelly and salmon and smoked lamb (no shark meat). We talked about crazy Icelandic politics: according to the latest polls, Reykjavik looks set to elect a mock political party tomorrow, called Besti Flokurinn (the Best Party) led by a stand-up comedian who may just become Reykjavik’s next mayor. Movie star & stand up comic Jón Gnarr: Reyjavík´s next mayor? According to Hrefna, the main platform of the party, if there is one, is (1) a polar bear for Reykjavik and (2) to build a prison to house all the bank criminals who caused the economic collapse. We then took sleeping pills, slept through the midday with a black blanket hanging over our window, and woke up after 6 hours to head for dinner at my publisher’s house. Tonight was my first time meeting my Icelandic publisher, Jakob Ásgeirsson, who had The Tricking of Freya translated into Freyjuginning. I met his lovely wife Margrét once many years ago because, like most Icelanders, she happens to be related to me. It seems I am in good company, as Jakob´s line up includes Icelandic translations of F. Scott Fitzgeral, George Elliot, plus one of my very favorite writers, Paul Austur. Dinner was rack of lamb, eagerly devoured by Oliver, myself and their two year old daughter, who kept merrily crying out “Kjöt! Kjöt!” (“Meat! Meat!”) as she snatched up jibs of lamb with her tiny fingers. We left my publisher's house with two boxes of Freyjuginning books to take on the road with us. I’ve always had a fantasy about being one of those writers who drives across county selling her books out of the trunk of her car. I never considered it might be Iceland. And everyone we’ve met so far is completely floored by Oliver´s ability to pronounce Eyjafjallajökull. PS Check out this wonderful new review of The Tricking of Freya at one of my most favorite blogs, The Iceland Weather Report. Off to Iceland for a Book Tour! It’s not something I ever considered back when I was writing The Tricking of Freya. I was just hoping to maybe find a publisher. Mainly, I was just praying I would finish the manuscript someday… A book tour in Iceland was far beyond my imaginings. Now, embarking on my fourth trip, I’m accompanied by my dashing fiancé and official book tour photographer, Oliver. I’m looking forward to reunions with relatives, seeing the amazing volcanoes and glaciers and waterfalls again, soaking in hot pools, and hopefully surviving the terrifying Icelandic roads. And the book tour itself! 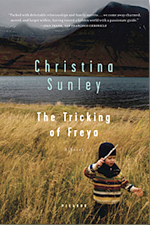 I’m so thrilled – and a bit nervous – for the chance to engage with Icelandic audiences, some of whom will already have read the Icelandic translation of my book, Freyjuginning. For my book events, I will actually be reading out loud a section of the book in Icelandic. I’ve been practicing madly for weeks trying to get my accent right. I’m much more nervous about whether I’ll be able to pronounce “hrjóstrugum” in front of a live audience than about whether the volcano will disrupt our flight. My ability to roll my R’s is maddeningly inconsistent. Sometimes I emit a perfect trrrrrrrrill, other times a flat old American R pops out. Our itinerary is becoming more packed by the minute; media interviews are getting scheduled and distant cousins are popping out of the woodwork. This will be my first trip back in nine years. One thing I’m very curious about is what changes I will see related to the economic collapse. It will certainly not be the same Iceland it was before. Our trip will be just over two weeks long, with four book events around the island. First stop is Reykjavik, with two book events, some family dinners, an excursion to Thingvellir, and an afternoon for Oliver on the lava-edged golf course of Hafnarfjordur, a town famous for its large population of Huldu Folk (elves). And lots more. Then we’ll start our journey East, hoping for a view of the volcano en route.